This is a simple add-on for playing your favorite character emotes. 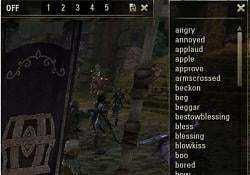 The game at the release had over 170 emote animation commands to choose from. There was no build-in GUI to display them for game launch. They are access via slash commands .i.e. /torch, /drink, and etc. This add-on allows you to configure a few favorites. It display them in a windows which you can click a button for the emote. 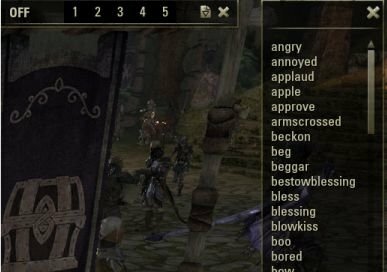 If you use a gamepad, ESO did create quick wheel for emotes starting with the Orsinium DCL late 2015. I hope you find the add-on useful. Feedback and suggestions are welcome. 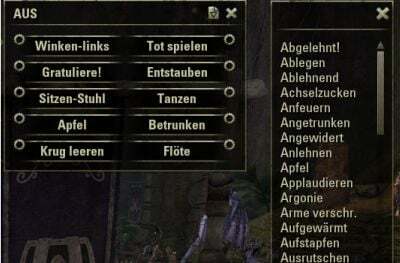 Use the add-on's emote name when playing in French, German, and/or you customized the ESOTheater emote name. EOSUI.com for hosting the add-on Wiki, forums, and the great community developers. /et <emote name>	Plays the emote based on the name. This is useful when playing in French, German, and/or you customized the ESOTheater emote names. /et -f##	Plays the emote based on the favorite's button number i.e. /et -f9 plays the emote you assigned to button 9. New emote call /crownstore. Your character kneels in front a treasure chest as it opens. Reposted for Minion downloading. I created the zip without the parent folder ESOTheater. Adjustments of add-on to lower the Global profile. Emotes match between languages again. /Torch and /kick are back in the English client! Full emote list window takes up the least HUD space when using a key bind. /et -f## Plays the emote based on the favorite's button number e.g. /et -f9 plays the emote you assigned to button 9. The favorite windows now can collapse to just the header bar to be even less obtrusive without closing it. Translation adjustments for German localization. UI clean-up to make it a little smaller. The close button is not on the bottom right any more. It's the X on the top right now. The configuration/playground window only displays the button name you are changing if in verbose mode. The duplicate Kiss and Eatbread are removed from configuration window list. No longer loading the EmoteTable to SavedVariables. Reading from localizations files. Support having Add-on to save either account wide or by character. 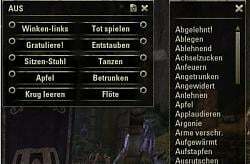 ********** MANUAL ********** Edit the variable "EmotesAccountWide" in ESOTheaterSettings.lua from 1 to 0 from character level saves. First stab at localization for German players and to resolve that they have two more emotes than English players. Big thanks to Valerius for the translations. 174 emotes ZeniMax takes one down. 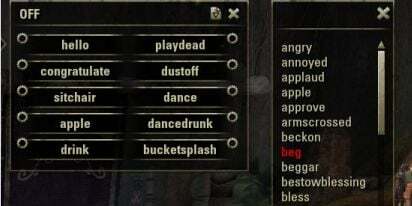 A 173 emotes... :( /torch was removed by ZeniMax in English language version. The Early Release version the emote ids start index shifted by one. This occurs in version eso.live.1.0.0.956792. As it stands /torch is not available. It was one but zero. The API for playing emote ignores zero. I placed a math hack for now in the hopes they fix it. GUI configuration window to set you favorite emote. The configuration panel let you preview the emote before saving. for your information, you will not see the addon until you enter /esotheater… took me a moment to find this out... I had no error messages as described here. unfortunately this addon has not been updated for ages, so all emotes since 10.2016 are missing...! I also tried LoveleyEmotes which I personally like more and doesn't need an update with every new emote! I've used this add-on ever since it was created and loved it. I so miss it now that it's not working. Please, please update. Im not sure if anyone else has experienced this, but the mod has stopped working ever since the Homestead update, the commands will not work nor the hotkeys, the addon is enabled on the addon list but its not showing up or working in general. Storing the emote settings account wide is not working properly for me. It would be nice if you can add them in the next update. 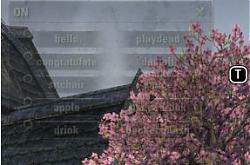 I have renamed the eat, eat3, and eat4 emotes to be a little more descriptive as /meat, /apple, and /soup in my addon. The /eat2 was an animation duplicate of /eatbread unless that has changed? Kiss was duplicated too but I'll admit I have not gone back to check the raw command to see if that is still the case. Re: FR emotes are gone ! French localisation file is actually filled with german translations !! Sorry about that, a new version is posted to correct it. FR emotes are gone ! I'll have an up date posted soon. keybind in Controls "Play random emotion"
can you pls add it?? Sure, do want a chat debug message of the emote that got selected? If yes, the ZOS slash command or the localization string from the add-on? One of these days I need to finish and add full emote messages but the localizations to include gender of the speaker and target are still a bit daunting. I'll get your changes intergraded to my SQL database. I produce the localizations files that way. 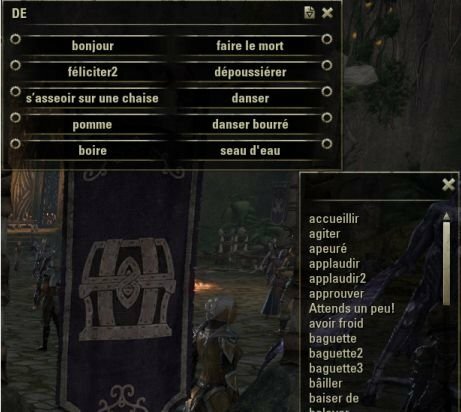 The folks that helped me with the German and/or French translations are no longer playing ESO. If anyone could help cleanup the French localizations, I be grateful too. I can produce a spread sheet with all three languages to exchange. I found this so much more friendly way for edits than the lua tables file directly.